The physician treating an athlete with a known or suspected meniscal tear needs to understand the structure and function of the meniscus and the factors involved in treating an athlete with nonoperative versus operative treatment. This article presents a program for rehabilitation after meniscal injuries, meniscectomy, and meniscal repair based on current knowledge of knee biomechanics. In 1978, Shrive et al reported that the collagen fibers of the menisci are oriented in a circumferential pattern. When a compressive force is applied in the knee joint, a tensile force is transmitted to the menisci. The femur attempts to spread the menisci anteroposteriorly in extension and mediolaterally in flexion. Shrive et al further studied the effects of a radial cut in the peripheral rim of the menisci during loading. In joints with intact menisci, the force was applied through the menisci and articular cartilage; however, a lesion in the peripheral rim disrupted the normal mechanics of the menisci and allowed it to spread when a load was applied. The load now was distributed directly to the articular cartilage. In light of these findings, it is essential to preserve the peripheral rim during partial meniscectomy to avoid irreversible disruption of the structure's hoop tension capability. An injury resulting in lesions within the blood-rich periphery is called a red-red tear. Both sides of the tear are in tissue with a functional blood supply, a situation that promotes healing. A tear encompassing the peripheral rim and central portion is called a red-white tear. In this situation, one end of the lesion is in tissue with good blood supply, while the opposite end is in the avascular section. A white-white tear is a lesion located exclusively in the avascular central portion; the prognosis for healing in such a tear is unfavorable. Repair of lesions in the red zone has yielded good results, according to Stone. Reports describe techniques for manufacturing a vascular access channel from the peripheral vasculature to improve the chance that tissue in the central region will repair itself. The menisci follow the motion of the femoral condyle during knee flexion and extension. Shrive et al presented a model of normal meniscal function. During extension, the femoral condyles exert a compressive force displacing the menisci anteroposteriorly. As the knee moves into flexion, the condyles roll backward onto the tibial plateau. The menisci deform mediolaterally, maintaining joint congruity and maximal contact area. As the knee flexes, the femur externally rotates on the tibia, and the medial meniscus is pulled forward. Studies by Shrive, Fukubayashi, Walker, and Kurosawa state that the menisci directly influence the transmission of forces, distribution of load, amount of contact force, and pressure distribution patterns. Meniscal injuries usually are associated with pain that results in gait deviation and loss of time from work and/or sport. A correlation of race and meniscal injuries is not known to exist. Meniscal injuries are more common in males, which may be a reflection of males being more involved in aggressive sporting and manual activities that predispose to rotational injuries of the knee. Mordecai SC, Al-Hadithy N, Ware HE, Gupte CM. Treatment of meniscal tears: An evidence based approach. World J Orthop. 2014 Jul 18. 5 (3):233-41. [Medline]. [Full Text]. Jackson JP. Degenerative changes in the knee after meniscectomy. Br Med J. 1968 Jun 1. 2(5604):525-7. [Medline]. [Full Text]. Shrive NG, O'Connor JJ, Goodfellow JW. 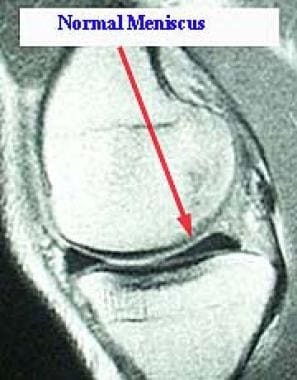 Load-bearing in the knee joint. Clin Orthop Relat Res. 1978 Mar-Apr. 279-87. [Medline]. Renstrom P, Johnson RJ. Anatomy and biomechanics of the menisci. Clin Sports Med. 1990 Jul. 9(3):523-38. [Medline]. Yeh PC, Starkey C, Lombardo S, Vitti G, Kharrazi FD. Epidemiology of Isolated Meniscal Injury and Its Effect on Performance in Athletes From the National Basketball Association. Am J Sports Med. 2011 Nov 30. [Medline]. Iobst CA, Stanitski CL. Acute knee injuries. Clin Sports Med. 2000 Oct. 19(4):621-35, vi. [Medline]. Yasuda T, Ota S, Fujita S, Onishi E, Iwaki K, Yamamoto H. Association between medial meniscus extrusion and spontaneous osteonecrosis of the knee. Int J Rheum Dis. 2017 Apr 5. [Medline]. Goldstein J, Zuckerman JD. Selected orthopedic problems in the elderly. Rheum Dis Clin North Am. 2000 Aug. 26(3):593-616. [Medline]. Stanitski CL, Harvell JC, Fu F. Observations on acute knee hemarthrosis in children and adolescents. J Pediatr Orthop. 1993 Jul-Aug. 13(4):506-10. [Medline]. Yoo JC, Ahn JH, Lee SH, et al. Increasing incidence of medial meniscal tears in nonoperatively treated anterior cruciate ligament insufficiency patients documented by serial magnetic resonance imaging studies. Am J Sports Med. 2009 Apr 9. [Medline]. Konan S, Rayan F, Haddad FS. Do physical diagnostic tests accurately detect meniscal tears?. Knee Surg Sports Traumatol Arthrosc. 2009 Apr 28. [Medline]. Rinonapoli G, Carraro A, Delcogliano A. The clinical diagnosis of meniscal tear is not easy. Reliability of two clinical meniscal tests and magnetic resonance imaging. Int J Immunopathol Pharmacol. 2011 Jan-Mar. 24(1 Suppl 2):39-44. [Medline]. Rytter S, Kirkeskov Jensen L, Bonde JP, et al. Occupational kneeling and meniscal tears: a magnetic resonance imaging study in floor layers. J Rheumatol. 2009 May 1. [Medline]. Wareluk P, Szopinski KT. Value of modern sonography in the assessment of meniscal lesions. Eur J Radiol. 2011 Oct 5. [Medline]. Vance K, Meredick R, Schweitzer ME, et al. 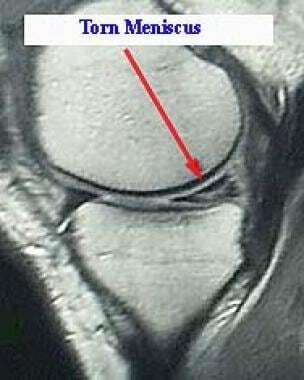 Magnetic resonance imaging of the postoperative meniscus. Arthroscopy. 2009 May. 25(5):522-30. [Medline]. Furumatsu T, Fujii M, Kodama Y, Ozaki T. A giraffe neck sign of the medial meniscus: A characteristic finding of the medial meniscus posterior root tear on magnetic resonance imaging. J Orthop Sci. 2017 Apr 13. [Medline]. El Ghazaly SA, Rahman AA, Yusry AH, Fathalla MM. Arthroscopic partial meniscectomy is superior to physical rehabilitation in the management of symptomatic unstable meniscal tears. Int Orthop. 2015 Apr. 39 (4):769-75. [Medline]. Stensrud S, Risberg MA, Roos EM. Effect of exercise therapy compared with arthroscopic surgery on knee muscle strength and functional performance in middle-aged patients with degenerative meniscus tears: a 3-mo follow-up of a randomized controlled trial. Am J Phys Med Rehabil. 2015 Jun. 94 (6):460-73. [Medline]. Jarrett JB, Sauereisen S. PURLs: When can exercise supplant surgery for degenerative meniscal tears?. J Fam Pract. 2017 Apr. 66 (4):250-2. [Medline]. [Full Text]. Gauffin H, Tagesson S, Meunier A, et al. Knee arthroscopic surgery is beneficial to middle-aged patients with meniscal symptoms: a prospective, randomised, single-blinded study. Osteoarthritis Cartilage. 2014 Jul 30. [Medline]. [Guideline] Siemieniuk RAC, Harris IA, Agoritsas T, et al. Arthroscopic surgery for degenerative knee arthritis and meniscal tears: a clinical practice guideline. Br J Sports Med. 2018 Mar. 52 (5):313. [Medline]. [Full Text]. Thorlund JB, Juhl CB, Ingelsrud LH, Skou ST. Risk factors, diagnosis and non-surgical treatment for meniscal tears: evidence and recommendations: a statement paper commissioned by the Danish Society of Sports Physical Therapy (DSSF). Br J Sports Med. 2018 Feb 2. [Medline]. Pekari TB, Wang KC, Cotter EJ, Kusnezov N, Waterman BR. Contemporary Surgical Trends in the Management of Symptomatic Meniscal Tears among United States Military Servicemembers from 2010 to 2015. J Knee Surg. 2018 Mar 7. [Medline]. Englund M, Guermazi A, Roemer FW, et al. Meniscal tear in knees without surgery and the development of radiographic osteoarthritis among middle-aged and elderly persons: The Multicenter Osteoarthritis Study. Arthritis Rheum. 2009 Mar. 60(3):831-9. [Medline]. Arthroscopic probing of a posterior horn complex meniscal tear with multiple flaps. Arthroscopic view of medial meniscus after excision of flap tear. The authors and editors wish to thank Kavita Gupta, DO, MEng, Department of Orthopedics, Center of Physical Medicine and Rehabilitation, University of Dentistry and Medicine of New Jersey, for her previous contributions to this article.